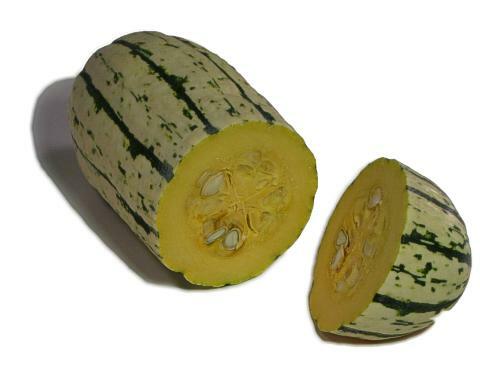 General Information: Delicata squash are of the hard shelled or winter squash variety. It is one of the tastier winter squashes, with creamy pulp that tastes a bit like sweet potatoes. Also called sweet potato squash, the delicata squash has a pale yellow skin with medium green striations. Inside, the succulent yellow flesh tastes like a cross between sweet potatoes and butternut squash. The oblong delicata can range from 5 to 9 inches in length and 1 1/2 to 3 inches in diameter. It's in season from late summer through late fall. Choose squash that are heavy for their size; avoid those with soft spots. Delicata squash can be stored up to 3 weeks at an average room temperature. As with other winter squash, the delicata is best baked or steamed. Nutritional: Delicata squash is a good source of potassium, iron and vitamins A and C.